Learn all you need to know about the MME Sales Tax Exemption! 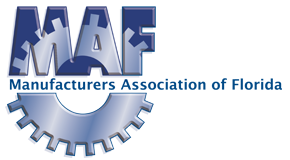 The Manufacturers Association of Florida is a statewide association of manufacturing companies and affiliated businesses that work to improve the business climate for manufacturing in Florida. Florida employs 377,400 workers, pays on average $59,389/year; and is a widely diverse sector of Florida’s economy. Manufacturers need qualified workers. Students with math, science, technology, computer and technical knowledge and skills can earn top salaries in manufacturing careers. Education policies that promote career and technical education will provide students with more career choices. 53% of the highest wage positions in manufacturing require certification or training beyond a high school diploma, and the average annual salary in Florida’s manufacturing sector is nearly $11k more than the collective average of all other industries. Manufacturers work on the cutting edge of the technological space and their infrastructure is primed to support innovative advances in the industry. MAF supports initiatives that drive new innovation and allow manufacturers to work smarter, diversify their markets, and establish Florida as the nation’s leader in innovative technology and manufacturing. Manufacturers want certainty in regulations, timeliness in obtaining permits, reasonableness in environmental permit requirements, consistency among government jurisdictions, and practical solutions for environmental challenges. Environmental regulation that allows manufacturers to partner with the state to solve complex problems creates a winning climate for all. Florida must keep a competitive edge in order to remain one of the top states to do business in the country. Reducing financial and tax burdens on our businesses will allow us to remain competitive and continue moving in the right direction to provide quality careers for Florida residents. Issues such as workers compensation insurance rates, business rent taxes, and corporate taxes, are all ripe for discussion about a competitive business environment.